We walked down Birdcage Walk, which borders St. James Park on the side opposite from The Mall. Birdcage took us back out to Horseguards Road. 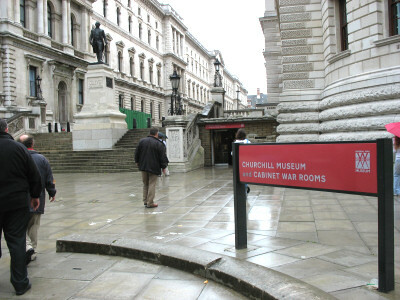 We noticed the sign pointing to the Churchill War Room, so we stopped in there. Susan and I are both World War II buffs, so we came to London with great anticipation to see the war room. The war rooms are the underground bunkers Churchill and his cabinet and chiefs of staff used to plan the war. At war’s end the facility was left pretty much untouched, and was unseen for decades, only recently being opened to the public. Admission was 11 pounds per adult, but we had a brochure our driver gave to us called London SmartSave Street Map. I think you can find them throughout London. 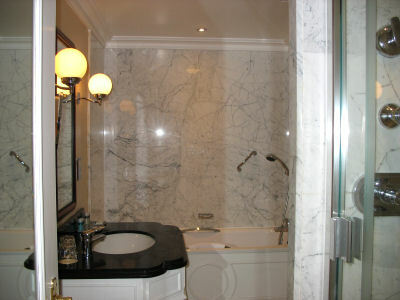 All the attractions and restaurants advertised in the brochure are 20% off for up to six people. So we got the tickets for just 8.80 pounds each. As you walk into the war room you receive a handheld audio device which allows you to hear pre-recorded information about specific points throughout the tour. You can pause, rewind and restart the recordings. The audios are available in several languages. The rest of the tour takes you through the ant farm of offices, situation rooms, workrooms, dining rooms and sleeping rooms assigned to the men and women who worked here during the war. There is also a Churchill Museum which has a great deal of information about the man, his writings, and his accomplishments. Some very unique and sophisticated technology is used in many of the displays, making them interactive and fun. The whole war room and Museum took us about 1 1/2 hours to view. If you are a student of history or World War II aficionado I highly recommend a visit to the bunker. After leaving the Church Hill war rooms, we walked on Whitehall Road past Downing Street where the prime minister resides. 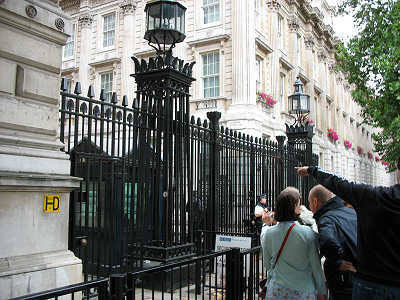 A large, sturdy gate, with large sturdy guards (who didn’t smile for the cameras that all the sightseers were pointing and shooting at them), wielding large sturdy machine guns, stood between us and the real 10 Downing Street door that you might see on the news. Obviously, the reporters are given special permission to be there and to film with the famous door behind them. We continued down Whitehall, stopping at a street vendor who was selling London memorabilia. Susan bought a couple of magnets and postcards. By now it was after check-in time at our hotel so we walked the short distance back, got our room keys and had our luggage delivered to our room. We found the elevator (“lift” in British speak) and headed to the fifth floor. Some of the hallways were very narrow, requiring any two people who happened to meet to have to turn sideways to pass comfortably. Our room was well appointed, with 12 foot ceilings, curtains rising all of those 12 feet, work desk with wired Internet access, two arm chairs and coffee table, armoire/TV cabinet, artwork and vases, refrigerator, tub and separate shower. There was a hair dryer attached to the wall in the bathroom, and an ironing board and iron were in the closet. Our room has a very small balcony but apparently for health and safety reasons, the windows must remain shut. I think rooms on lower floors may have had open windows. Before we left the US we made sure to purchase the proper electrical plug adapters as well as a power converter necessary to allow Susan to use her curling iron and me to recharge my video camera battery. Different power converters are necessary for different types of electrical needs unless you get one that adjusts automatically depending on what’s plugged in. We bought the more expensive converter which came with plug adapters for all countries around the world. That was about $45 (US). After we got here I noticed that our room had both the normal British electrical outlet, and also an American outlet. So, we didn’t need the adapters or converter, but at least we’ll have it for future trips. You might check with the hotel you will be visiting to see if the room has an American outlet. You could save $45 on the converter. By this time I was extremely tired since I didn’t sleep on the plane. We both took a nap for about two hours. 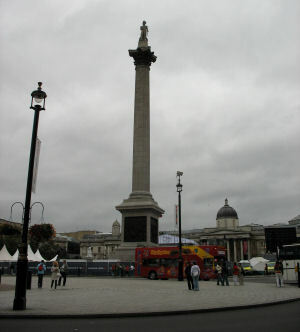 After our nap, we walked to Trafalgar Square, which is only a short distance from our hotel. We looked around the square a bit, then went into a shop where Susan bought two postcards. By this time we were hungry and we decided to eat. There are restaurants everywhere here, especially the local pubs. We picked one, went in and found no one to seat us. We weren’t sure what to do or if we just seat ourselves, so we left. Tip for British restaurants: make it greased-chute easy to figure out how to use your services. We walked 15 feet down the street and followed a sign to the Walkers on Whitehill pub that occupied the alley location. We weren’t sure how to get in since the doors were all closed and didn’t seem to be unlocked. Finally a woman came and opened the door for us and we walked in. She directed us down the stairs since they only served drinks on the first floor. We made our way down the stairs. There was no one there to seat us, but I did see a cook back in the kitchen and asked him if we should seat ourselves. He said yes and we did. The cook was also waiting tables, including ours. He took our order and about 15 minutes later he finished cooking it and delivered it to our table. Either they were shorthanded or not very busy, since the cook was doing everything. I ordered a hamburger and french fries. Susan ordered some kind of meat and onions on bread. She wasn’t real impressed, nor very full afterward. My burger was decent. It had some kind of salsa-like substance on it, plus some Canadian bacon. The beef wasn’t what I was used to, and didn’t seem to be the highest quality, but it was still good. Perhaps it’s just those stiff upper lipped British cows. We finished the meal, which came to 17.80 pounds, and left. We walked up The Strand, which is one of the roads heading into and out of Trafalgar Square. There are many stores and restaurants, and a few shows, such as Stomp, on The Strand. After walking for maybe 10 minutes, we decided to turn around, and walked down to the Hungerford Footbridge, which crosses the Thames at Embankment Pier. 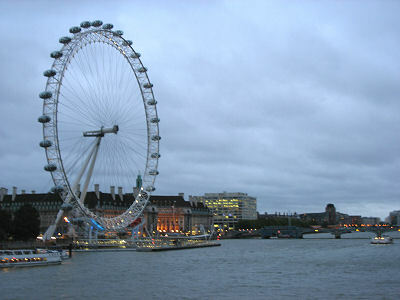 The bridge crosses very close to the London Eye on the other side, so we got our first unobstructed view of it. We took a few pictures and enjoyed the view of the waterfront. 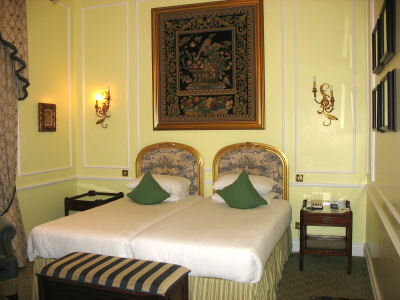 We were both exhausted and returned to the hotel. We were soon in bed sound asleep. Unfortunately we had gone to bed about 9 o’clock, which is far earlier than my usual back in Atlanta. My normal sleep hours are 3 a.m. to 8:30 a.m. Atlanta time (five hours behind London time). It was like going to bed at 4:00 in the afternoon back in Atlanta. So I woke up about three hours after falling asleep and was awake for 30 minutes before falling asleep again. About 3:30 a.m. London time I woke again, and stayed awake for an hour that time. I finally fell asleep and slept soundly until we got up around 9:30 a.m.